French Fingerling Potato | Gurney's Seed & Nursery Co.
Main. Rose-pink skin and creamy yellow flesh splashed with pink make this variety as beautiful as it is delicious. Larger and thicker than other fingerling types, with an outstanding nutty flavor—this variety is perfect for any preparation. Thin, delicate skin doesn't need to be peeled to use in any of your favoriterecipes—try them baked, boiled, fried, mashed, in salad or for cooking—you can't miss. Resistant to scab. Spacing8 - 12 inches apart with 30 - 36 inches between rows. FruitRose-pink skin and creamy yellowflesh with some splashed with pink. Fingerling shape. Soil RequirementsWell-drained, fertile sandy loam soil. pH 4.8 - 5.4 Will grow in higher pH, but sometimes will become scabby. Seed CountOne lb of seed potatoes will yield approx. 5 - 8 sets and plant approx. 5 - 8 ft of row. CommentsThe gourmet's choice. 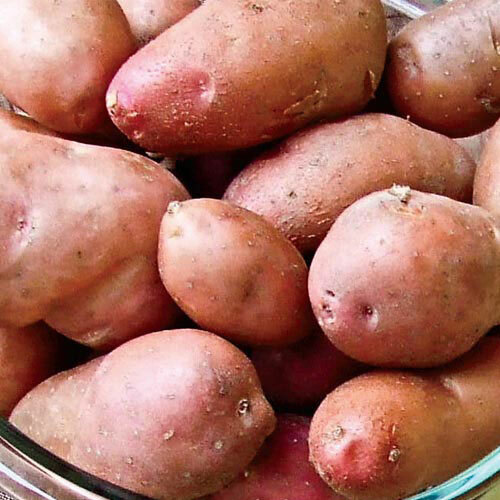 Lovely fingerling potatoes have creamy waxy yellow flesh with some splashes of pink and rosy-pink skin. Delicious in any preparation you can think of. Slightly larger and chunkier than other fingerling types. Resistant to scab. YieldUnder optimal conditions, you can expect to harvest 10-15 pounds of potatoes for every pound of seed potato planted. Days To Maturity80 - 100 days. Main season variety.